Easy peasy today which is probably a relief if you have just made it through the placket! This is stage 4 and 5 of the pattern instructions. Sewing the shoulder seams and side seams and your first opportunity to try on. There is not much I need to say as you are basically sewing straight lines here. I did find I needed to stretch the shoulder back sections to get them to fit to the front sections but as there is a bit of bias in the fabric here that was easy enough. My shoulder seam is below, after seam neatening but try on for fit before finishing your seams! And the hem is easy, I tops stitched on the edge side close to the fold. I'll be back at the weekend and we will be setting the sleeves and finishing the cuffs- both easier than the inset! Sew-Ichigo up and ready to see! Penny and I have got the Sew-Ichigo blog up and running, Penny has posted a teaser pic and are working flat out getting the patterns and all the boring behind the scenes techy stuff sorted out and ready- there should be a little bundle of patterns on sale in the next few weeks! Meanwhile, visit, follow, grab the button at the site, it would be lovely to have you with us, and a big, big thankyou to those of you who have already done so, we really appreciate your support! The first sewing section! Jenny's instructions are clear and her photographs are helpful so refer to them at all stages of construction. Jenny also gives advice on altering the bust size of the Tova here. I am doing is going into greater detail on the trickier bits. The seam gauge that she shows in her pattern pictures is very helpful throughout. I used a walking foot on my machine for both Tovas. The benefit of this is it pulls both the top and bottom fabric layers through evenly. You could use a standard presser foot too. My walking foot is at the top and presser foot below. The same feet but from a bird's eye view. You can see my pieces ready below for my voile version. The plackets are the strips, the insets are the wider L shaped sections. My voile insets are double thickness and basted together at the edges and treated as one layer. Using a double layer in this way to compensate for the lightness and transparency of the main fabric is called interlining. My Lotta Echo version below has a single inset on each side. The thing to watch for here to make sure you stitch the right side of the placket to the wrong side of the inset- it is a little counter intuitive, you will want to do it the other way round. You can see on the Lotta Echo version below how the triangle notches help to match up the plackets and the insets. The placket edges have been top stitched. You can see the fussy cutting on the voile version so both sides of the inset match up. At the bottom of the inset where the two plackets cross over, Jenny suggests you pin these together. I chose to machine stitch them within the 3/8" seam allowance, about 1/4" is fine. It keeps everything secure and gives less to worry about for the next stage. Jenny suggests very close gather lines 1/8 and 1/4. I tried this and I tried wider- 1/8 and 1/2"- the latter was easier for me because when you sew the seam you will be stitching between the gathers as you can see below (this is from a sleeve cuff). I did 1/8 and 1/4 for the Lotta Tova but the wider options for all the other gathering sections on both Tovas. You chose what you prefer. Before you pull the gathering threads, you will need to secure the corners of the front piece. Jenny's drawing shows where the reinforcement stitching will go. I used a ruler and pencil to mark the line just inside 3/8" from fabric edge and where it would start and finish on each side. It will be inside of your tailor's tack which marked the drill hole or dot with circle around from the paper pattern piece. Change back to your usual thread, set you stitch length very short-1-1.5 on my machine and sew. I then sew again, just inside or even on top of this line to make it extra secure. Take care not to trap the gathering threads. Repeat for other corner. Clip the corners- this means with sharp small scissors cut from outer cover to the corner just before your stitches. I place a pin here to make sure I don't cut the stitches. Remove pin once cut. You can follow Jenny's direcitons and start pinning inset to front starting at shoulder. If you are newer to dress making you might find it easier to start your pinning in the centre fof your front piece and the inset. Pin at the notches- your pins need to be at right angles to your stitches. . Pull your gathering threads so that the inset is the same width as the front between the notches- you can wrap the ends around a pin to check and make a knot when you are happy with this. Spread your gathers evenly. I do this firstly with my fingers and then with a pin, stoking the fabric back and forth between the gathering lines. You can then pin the side pieces, matching any notches,- it will be tight where the reinforced corners have been clipped. and you will need a lot of pins. Follow Jenny's directions and start at the right shoulder, stitch length normal- 2.2-2.5 is my normal, the first straight section down the sides is easy, slow down as you get to the first corner and I change my stitch length to shorter here 1.5 as it needs to be secure as we come to the clipped corner. You should have a tailor's tack or mark to aim for, at this point do as Jenny says, stop, needle down, lift the foot and pivot- turn your fabric. Check you are stitching through 2 layers and no extra fabric is trapped before you put the foot down again. You should be stitching to the inside of the reinforcement stitches. You can just see mine in the centre of the machine foot below and my needle is to the left of them. Stitch about 1" with small stitches and change back to your usual stitch to sew along the gathered section of the inset- the gathers should be on top. If your gathering threads were 1/8" and 1/4" apart you will be stitching below them with your 3/8" seam. If your gathering threads were 1/8" and 1/2" apart you will be stitching below them with your 3/8" seam. I stopped and checked my gathers several times as I stitched this seam between the notches. When you have reached the notch at the end of the gathers, reduce your stitch size , go slow and stitch to the tailor's tack as before, check for trapped fabric, pivot and stitch along the secured corner. change your stitch size back to normal and stitch seam to the top left shoulder. This is a very tricky section. Go slow and be prepared to unpick the odd section where you have trapped extra fabric. my first took me two attempts. Once you are happy with it you can remove the gathers, tailor's tacks and press well. Follow Jenny's instructions, press seam towards the inset and finish the seam edge with a serger/overlocker ( I turned the knife off on my overlocker as the seam is already narrow) or you can use zig zag or overcast (depending your machine options) on medium weight fabric or 3 step zig zag on lightweight fabrics like voile/lawn to neaten the seam. If you have no zip zag you could overcast by hand or use pinking shears. There is a discussion thread here on finishing Tova edges without a serger here. Sew slowly as you finish the edge and watch out again for trapped fabric. Press again and top stitch all round the inset, I did a extra securing line of stitches where the placket overlaps. This is my Lotta Echo inset and placket finished. And here is my voile version. This is the inside of echo with overlocked/serged seams pressed up and top stitched. And this is the voile version with a close up on the tricky corner. 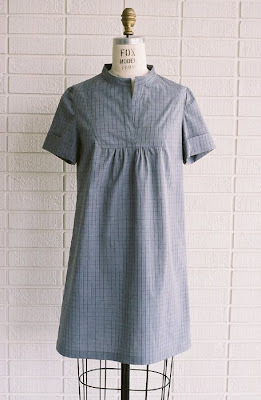 The next sew-a-long post will be mid week with shoulders, side seams and hem- nice and easy. You can find the links to all the post so far here and add any pictures to the Wiksten Flickr group here. Any questions will be answered in the comments thread below, please add your ideas if you can help. I wanted a narrower collar so reduced the height from the top of the collar pattern piece by 1/2" - you can see my new cutting line below. I also rounded the ends using a cotton spool. The dashed line was my size so that is where the rounding fits- nice and simple! Remember the dseam allowance will make the curve tighter than the line your draw. Cut out the pattern piece using the new lines. The lower line stays the same as this attached to the Tova. I like the look of 3/4 length sleeves but I don't like wearing them, I always feel like something is missing! As the sleeve pattern piece stays the same width all the way down the main section you can easily lengthen or shorten. Obviously if you lengthen, you will have to allow for extra fabric! For lengthening or shortening, go to your wardrobe and fins a shirt you like with a standard shoulder seam. Put it on and measure from the shoulder seam to where you want the seam to finish. The Tova cuff will add on about 1/2". I chose a finished length of 22 1/2" sleeve including cuff, that makes the sleeve without cuff 22". Now add on 3/4" for seam allowances. Result: the sleeve pattern piece needs to measure 22 3/4" at the longest point- the grain arrow marks this on the pattern piece. I pinned my pattern piece on and drew the extended length at the bottom using Frixion pen- you can see it faintly in red below. As the sleeve is longer, the cuff may need to be narrower. I recommend you cut your cuff using the pattern piece and reduce this later. I will cover this when we come to sew the sleeves. 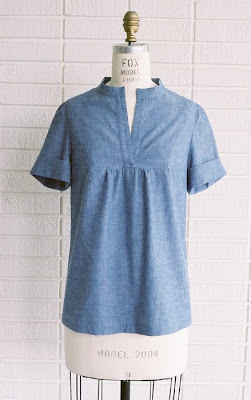 Top with short sleeves and cuff. Jenny used fabrics that look the same on both sides which means an easy turn up cuff for the end of the sleeve, this is like the hem on the Tova but shows on the outside rather than hiding on the inside. For this, find the total sleeve measurement you want e.g. 8". Add on seam allowance for the top and for tuning under on the cuff-3/4", then add on the length you want the cuff to be, maybe 2"? Total sleeve length to cut= 10 3/4"Similar method to working out the length. If you want your cuff on the inside, you could use the same hem as the bottom of the dress and top, so for a sleeve of 8" add seam allowances of 3/4" and hem turn up of 1"-total of 9 3/4". You can either draw your new higher hemline on the pattern and trace off a new sleeve or cut you pattern- up to you! If your fabric is wider- the voile I used was 54", you will be able to fit more pattern across the width of the fabric but I did this in sections. You can see in the photo below that there are two folds, one on each outside edge. I pinned the raw edges because I was matching up my stripes so the top and bottom were the same. It helps to do this for stripes of larger plaid/check as when you cut out a pair of pieces e.g. sleeves, they will be the same each side. This fabric was just for the front and back. I placed my pattern loosely on the fabric first to work out how much i needed and then cut across the length so i was working on this section only. The fold lines will be the centre of the front and back of your Tova. You could have a stripe as your centre point or a row of squares in a check. I choose to have the wider blue stripe as the centre. Depending on your pattern and size you may be able to fit your front and back pieces like this- depends on both these things. My patterns fitted but you can see how they are running in opposite directs. This only works when you pattern runs in both directions- it doesn't have a right way up! It didn't work with the Lotta fabric I used on the white version. You can see the arrows follow the straight grain of the fabric. For the sleeve I went back to my length of fabric and again I made a fold, partway along the width of the fabric, wide enough to allow the sleeve centre line (the grain arrow works for this) to be in the middle of a blue stripe. I pinned the raw edges and the far edge where a selvedge is. You can see on the left edle of the sleeve it is very close to the fold so there is hardly any waste on that side. On the right side there is a little more wastage but it worked pretty well! For the inset placket I knew I would never get the lines in the right place on the bigger places so I placed them so the stripes ran across. You could also do this on the bias for diagonal stripes or plaid/checks. I also lined each piece so there is a second piece underneath and I basted round the edge as the voile is really thin. I would also recommend you did this for bias cut pieces, line them with a straight cut piece or a thin piece of matching cotton underneath cut straight grain to stabilise the bias which stretches so easily. For this method of lining, you treat the two layers as if they were one piece of fabric. These are small pieces of the Tova so they can take a bit of playing with the grain. it is like fussy cutting for clothes. This is my finished voile version and I absolutely love it. I wear a lot of blue so it goes with a lot of my wardrobe and the soft silkiness of the voile is so nice to wear. The lining on the inset section means it is not too see through, the darker colour helps with this too. I am going to enter it into the Made by Rae Spring Top Sewalong . A great idea for all those Tovas that are going to be made! Back at the weekend with the first sewing- sewing the inset to the front- the hardest bit of the whole Tova so lets get it out of the way! This post covers basic cutting out and transferring paper pattern marks. Part two covers more advanced stuff including simple variations like rounding the collar, altering the sleeve length and making Tovas out of patterned, striped and plaid/check fabrics. I think cutting out is best done in a single session so set yourself a couple of hours to get all your Tova pieces cut out in one go. These are my cutting tools of choice. You can see in the photo above that the front piece is lying right on the fold, the back piece needs to do the same. I pin the pieces loosely to the fabric just to check they fit together correctly. Then I pin them more carefully and line the grain up properly. To do this, use a tape measure or a quilt rule, measure from each end of the arrow to the selvedges- it should be the same distance for each. After you have pinned and checked all your pieces you will have a choice on how you cut out. You can cut carefully round each pinned section. Pins can distort the paper so this is not always totally accurate. I prefer to take the pins out and draw round the paper using Frixion pen which will disappear under the heat of an iron. I then use a rotary cutter with the ruler always inside the line on the piece itself to cut usign the pen line as my cutting guide. You could use weights like wing-nuts or metal washers, trace round and skip pins altogether. Any tricky tight bits I cut with scissors, big and small. After cutting I pin the fabric together again to keep everything in one place. But before you cut, there are some vital marks to add! Luckily on this pattern, there are very few marks to transfer but there are some important ones that really need atention. You will see a T mark on many of the pattern pieces. These vary in position according to the Tova size but all sizes have them. I highlight all the T marks in my size on the pattern pieces. You can see my pink highlight below and another mark, the dot in the cirlce that I'll mention in a minute. So back to the T- these are marks to help you match up the seams where the different pattern pieces will meet. The easiest way to transfer them is to make them into notches on the edge of the pattern pieces. Where you see a T add a triangle, the width of the T to the cutting line. This is the same mark on another pattern piece, I have just moved the paper pattern back a little so you can see it more clearly. You need to use little scissors to cut these, they are fiddly but you will be so glad of them. I used very sharp embroidery scissors. You can cut them out roughly as you are cutting the pattern piece out and then neaten them afterwards if you prefer. The triangle notch on pattern piece should go outwards, you can see this above the scissors in the pic below- the inward notch is what is left behind on the remaining fabric- below the scissors in the same pic. Now the other pattern mark needs to be transferred- the dot in the circle on the front which marks where the front inset panel will fit. I choose to use tailor's tacks are here as they are easy to remove and leave no residue. I have a youtube tailor's tacks tutorial here. I fitted the sleeve close to the selvedges as it didn't need to go on the fold. As the sleeve cuff and the plackets look the same but run in different direction, I kept the paper pinned to them after they have been cut out so I didn't muddle them up. Pieces cut out, ready to sew. This is how my first Tova ended up- just so you can get an idea where we are heading and how a quilting fabric looks as a Tova. I altered the collar- and made it narrower and rounded. I lengthened the sleeve and I took a few inches off the hem as well. That is covered in part two of this post. It is a great fit. I made size small. My chest ( complete with generously padded bra) measures 34" and I am a UK size 8-10, I think that is size 4 in USA and 36 in Europe. I am shortish in the body so needed a shorter hem length to make this version look like a top or a tunic. 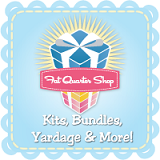 Visit part 2 for alterations and cutting striped, checked/plaid fabrics. Questions will be answered in the comments thread, do feel free to chime in and help! It is my turn in the Sew Out Loud blocks- I guess you are all still reeling after Charise's amazing Design Studio block last week! Many of the fabrics for this block were supplied by the Fat Quarter shop who generously sponsored the Quilt-a-long and I have listed the fabrics at the end of this post. Once it it turned through and pressed, this is where you position it on the background fabric strip- the red mark is the centre of the bottom edge. The loop should be pointing upwards. And this is the loop hand stitched on and long ends trimmed. Another technique that I use in both patterns is using tick marks to join pieces and sections really accurately. The trick is to place pins vertically through the tick marks to line them up perfectly front and back. You can either slide the pins out and hold tight all the way to the machine or pin within the seam, fine pins help for this.